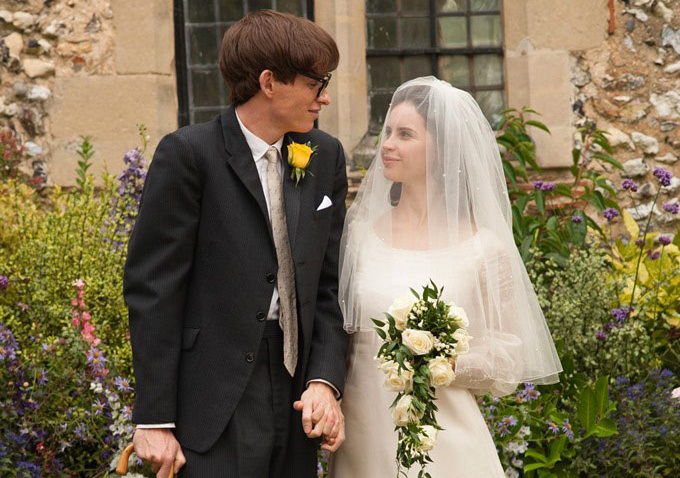 In “The Theory of Everything,” opening November 7, Felicity Jones plays Jane Wilde, the first wife of Stephen Hawking. The drama’s much buzzed-about performance is, of course, Redmayne’s, whose physical transformation into Stephen Hawking is a remarkable thing to watch. But Jones is not one to be relegated to just playing the wife of a genius. Jane goes through her own changes throughout the film, and Jones was determined to get her transformations, both physical and emotional, just right. 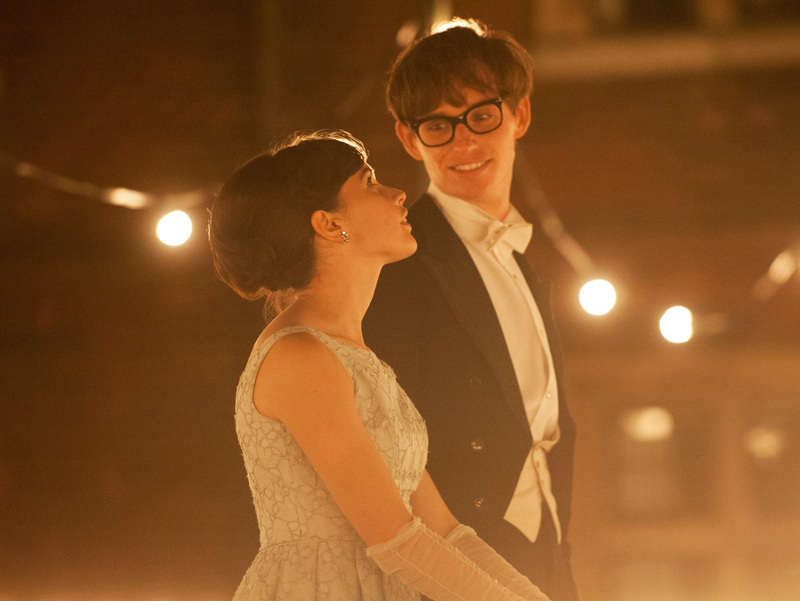 Jones sat down with Indiewire to discuss her own exploration of Stephen and Jane Hawking, which included an on-the-spot shift into Jane’s vocal patterns. 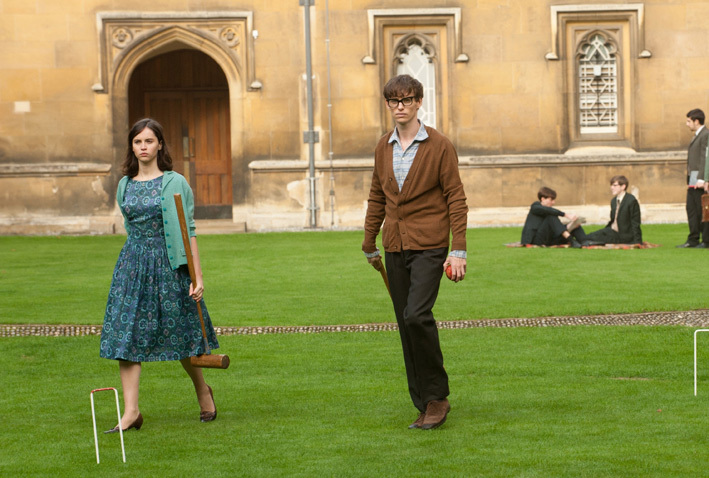 Did you know much about Jane Hawking before you signed onto the film? I didn’t know anything about her. My first encounter with her was reading the script and just being completely blown away by how amazing she was. I then thought, “This woman is incredible, I really want to do this.” James [Marsh] fortunately told me straight away after the audition, “I’d love you to play her,” which was really nice because I didn’t have those two weeks of biting my nails, waiting by the phone wondering am I going to get the role? He was just very instinctive and then from that point on I just became completely obsessed with Jane Hawking and wanted to know exactly who this woman was and how she had been able to support Stephen Hawking so phenomenally. What did you discuss when you met? I went around for dinner — her and her husband Jonathan, they invited me over and I went and remember sitting in Jane’s conservatory drinking cups of tea and eating biscuits, which is very English. We just talked about Stephen and their relationship, how that affected her, her own desires to have an academic identity and that struggle between her role as a mother and wife, but also an academic in her own right. She lent me clothes. I tried on a coat she wore in the 60s when she met Stephen. She showed me photographs of her and Stephen when they first met. I remember seeing her in her sitting room sitting cross-legged. She has quite childlike mannerisms. It was a beautiful moment seeing her looking at this old picture of her and Stephen just after he had been diagnosed. They’re both on the River Cam in Cambridge. They’re both so young and you can see in their eyes, they’ve just fallen in love, but they know that Stephen has been given two years to live. It’s this extraordinary image. I felt like I was given this window into their extraordinary lives and she was completely open from the very beginning. Did you learn anything new from her that you hadn’t found out in your own research? A lot of it was like being a detective. I was watching her movements, her mannerisms. I worked with a movement coach. She’s very balletic. She loves dancing. Her and Stephen used to go to these dances together and Jane would dance around Stephen’s wheelchair in the middle of the dance floor. She’s very precise in the way she moves. There is an elegance to it. She also has a very high pitched voice, a very particular voice. It’s very musical. So again, I worked with a dialect coach and a music coach. She loved singing so I had to learn how to sing. So did you read her memoir? There are two versions, right? So she wrote the book just after the divorce. Then later on there was a re-edit when Jane had some more perspective on the relationship and wanted to change certain things that she had said. I think she felt like she had time to — she felt very hurt straight after the divorce. Naturally, as you would, there’s a lot of pain when that happens. A few years later she had time to think about it and wanted to make some changes. I’m kind of a space geek but not particularly knowledgable on the subject. How familiar were you with any of the science that came to the film? You have one scene at the table where you are explaining one of Stephen’s theories. Was any of it totally over your head? How much of Stephen’s theories did you get? That’s partly why I wanted to do the film. I love what he’s studying. I love the idea of why we are here, all those philosophical questions. What’s interesting about science and religion and trying to answer these questions: what is the point of our existence and how did we get here? I love that kind of macro level of investigation. So, I read Stephen Hawking’s “A Brief History of Time,” which I understood parts of, but not all. It’s that thing when you’re reading it and you’re like, “I’m getting this. I get that. I get that.” And then if someone asks you what is black hole theory, actually trying to explain it is really difficult. I loved doing that scene where Jane is explaining, in a quite simple way, the scientific reasoning. And I hadn’t had scenes like that before where you see her intellectual capacity coming through. It was a great scene to play. Also, it was very much what was happening in their relationship in a sense because Jane used to type up Stephen’s theses, his notes. In her book, Jane says, she was always saying to Stephen is there a way of making this more accessible? Making these incredible theories more knowable for the general laymen? It’s interesting in some ways that “A Brief History of Time” came out of their dynamic. Tell me about capturing her determination. A big part of the movie is her thinking she’s going to have two years with this man, but then he lives for so long. You see that swaying in the later years, but how did you capture her will to stay? Well I was just so admiring of it. She just never gave up. She was a woman who had incredible strength of mind and had it a very young age — at 17-18. She was a person who — the medical profession would say, “You’re wasting your time, this man is going to die,” and she just went, “No he’s not. No way. Not on my count.” She stuck by that. It was trying to get inside Jane’s head in a sense, and part of it is she’s very black and white about things. She’s not indecisive. She doesn’t procrastinate. She has beliefs and she sticks by them. She had that in her from a very young age. Tell me a bit about working with a movement coach, what were your goals? I worked with Danny McGrath who is at the Guildhall School of Music & Drama in London. Because I was playing Jane from 18 to in her 40s, I wanted to subtly show how your body changes throughout that period. There are certain things: the way your spine curves and to subtly show how Jane was aging. That was why I met the movement coach. I very much wanted to capture Jane’s essence. I felt that the key elements of attack were her physicality and her voice. [She begins speaking in Jane’s voice.] It’s on the air, but it actually has a lot of force behind it. Even though it’s quite light. You definitely listen to what she’s saying. That was an interesting thing to do as actor, to get the lightness. It’s quite a girly voice, but underneath it there’s incredible persuasion and push. That was a lovely challenge. What was it like to watch Eddie completely transform throughout the film. It was absolutely incredible. Not only was he having to take on this extraordinary physical journey of a person, but Eddie is also someone who is constantly helping you out as the other actor. He’s selfless in that way. He’s pushing you at the same time he’s doing his own performance. He really is extraordinary. The physicality — it was just so — he prepared at length and he could jump in and out of it. So literally he’d be sitting when Stephen was in the chair towards the end of the film and then the next minute he’d be walking around drinking a coffee. He’s someone who can jump in and out, which is extraordinary. As a British actress do you ever feel like you might be pigeonholed into period pieces? I know you’ve done “The Amazing Spider-Man 2” and you’ve done “Like Crazy,” but is that a worry? Well I never let the period be an obstacle. I always just treat the characters, really. And if there’s something that I’m going to be interested in playing, it’s about people. People don’t really change massively. I think human impulses are the same centuries ago and they will continue to be the same. I try not to let that limit me in any way. It’s just having an instinct towards something, a spark in the script and an interesting director. Then you think, “I want to jump off the board. I want to jump into this. Lets do it.” I try not to have many rules. I think you have to see what hits you in the gut. Has anything hit you in the gut that you haven’t gotten to play yet. Any kind of part or film? I’m about to do this film called “A Monster Calls,” where I’m playing this woman who is in the very last stages of dying of cancer, which has just been mind-blowing, exploring what that feels like for someone. Knowing you are going to die, it’s an extraordinary thing for anyone to go through. Also, that’s a very physical part and I’ve learned so much from watching Eddie and then doing it myself. Showing someone’s physical deterioration is a different challenge from playing someone like Jane, which is a very nuanced emotional journey. The film has gotten — for you and Eddie — quite a bit of awards buzz because your performances are so fabulous. How would it feel to get a nomination for this? Is that something you think about? No. I haven’t thought about it. It’s just been incredible because you never know how people are going to respond to a film. I’ve made lots of films where people don’t like them at all. You kind of go with very low expectations. But with this it’s just people seem to respond very emotionally towards it and if that keeps happening and people like it then that’s a great great thing.